You ever see a show that hits all the right notes? Obsidian Theatre Company’s Oraltorio: A Theatrical Mixtape playing at the Young Centre for the Performing Arts is just that: a pitch perfect performance. Following young B (the incredibly talented Motion) and her DJ (the equally amazing DJ L’Oqenz), the audience is taken on a lyrical journey through space and time exploring the cultural histories of black Canadians. There is something haunting and magnetic about Oraltorio that defies words. Maybe it’s Motion’s incredible voice, or the accompanying mixing of L’Oqenz, or the fact that they have a wonderful onstage fluidity as they play off one another, but I got chills watching. What Motion and L’Oqenz have created is a show that initiates the audience to the struggle to find radio stations not dominated by the white, male rockers. There are figures virtually unknown today, despite their contribution to musical history, such as Matilda Sissieretta Joyner Jones,or Memphis Minnie, are brought to life. Within the show music literally gives voice to generations silenced by systemic oppression. As B takes on these roles she’s not just dancing and singing, she’s listening. It’s a dialogue that is embodied instead of spoken. We see B continuously lean into the boombox or put on her headphones before she’s swept to the next figure. It’s like that moment you get swept up in your favourite song on the radio but in a show. But don’t think for a moment that lets you off the hook to just sit back and enjoy the music. In a move that is insidiously brilliant, Oraltorio also plays with its audience as both observers and participants in cultural moments. One moment cleverly baited a positive response to a smiling dance quickly revealed to be a minstrel show. 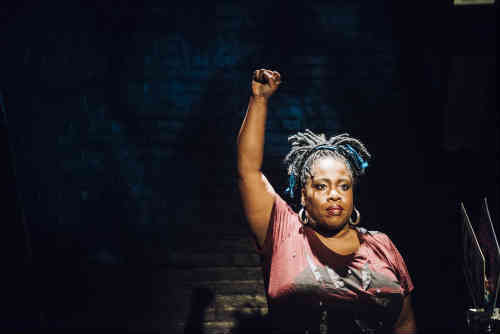 The audience is initially invited to enjoy the show before images of blackface are projected onto the screen behind B, who sinks to the floor with her head in her hands, no longer smiling. And that’s not the only moment that puts your heart in your mouth. Oraltorio weaves effortlessly between comedy, drama, and socio-political horror. You never know whether you will be laughing or in shock within a single moment of the show. Even the set by Jackie Chau, the projections by Ramon Charles and Laura Warren, serve the experience of the show. Neon boomboxes, asteroids painted on the floor, and video snippets send B flying through time facing laughing audiences or joining protests. The DJ, elevated behind her is a constant figure. There’s almost too much to watch but Mumbi Tindyebwa Otu’s direction makes sure your attention is never divided. Instead, the show leaves you with the impression that if you came back one more time, you’d catch every reference, every nuance to the work. And Oraltorio is so good that you’ll want to see it multiple times. I know I do.